Okay, I am really excited because I finally took the time to figure out how to upload pictures to my blog (like I said, I am a little behind the techno train.) So until I have time to blog about a few things I wanted to share pictures of (like my school room!) I thought I would share a picture from our garden. 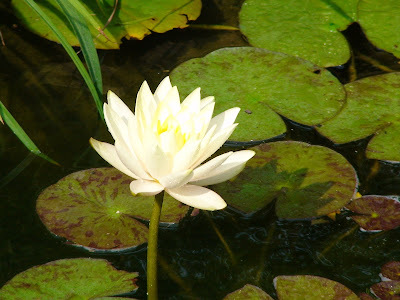 Last year our lilies struggled along, this year they have spread all over the little pond, and finally, we have blooms! Since this blog was posted by "She Who Must Be Obeyed," am I to assume the blogger is actually your third child?!?! took me a minute to figure out what in the world that meant - until I clicked to see who it was posting :) In your world I guess that would be child # 3, in my world that would be me! Good to hear from you, I look forward to checking out your site. Sorry, can't go along with that :(. Who else but the Queen could have her feet massaged by her Lord Chancellor whilst reclining in her limousine?